so i have a one man show with relatively small amount of transactions i was at first pleased with the upload of paper receipts and download of the bank statements processes ! then you started to capture bigger fish in recent years and you have forgotten the likes of me? i just want a report to pass to my accountant of detailed expenses and overheads to my business so he can in one hit check my accounts and sign them off without the …whats this for conversations? please bring back the drilled down transaction reports the zip file nominal account download crap is no good to me? The old nominal code drilldown that we used to provide from the chart of accounts is almost exactly the same as the one we include in the zip file. We had to move to this set up due to the drain on server resources. What information are you looking for exactly? Perhaps there is an easier way that we could direct you to? what i want to show my accountant ? then format it and create the roll up balances my self? please bring the detailed report back? I’m sorry to hear that you think this. You’re welcome to start a feature request thread if you wish with any suggestions you have for new reports etc. Providing they are reasonable (e.g. size and processing wise) and there’s enough interest, we can certainly take a closer look, as we do with all feature requests. From what I recall, the detailed report that’s included in the zip file is the same as what the one in the Chart of Accounts page itself used to be. The easiest way to give your accountant everything (invoices, notes, documents, complete ledgers) is to give them access to your QuickFile account. If you manage your own account, you can do this by going to Team Management in the Account Settings menu. If they have an Affinity account with us, they can request access through their own account. i understand you wish to force customers into new process but don’t forget those that do not wish to change. i am in general happy with Quickfile but you are forcing me to try out new software as you do not deliver what i want and worse have changed the reporting process mid stream … and backwards i might add? so the tools/code are there and the structure ? please bring back the multiple code reporting process for this report and you have a customer for life? I’ll ask our development team to look at a few options and see what they can come up with, although they are currently working on a few different things so I can’t give any timelines at the moment, but we’ll keep you updated. I have asked my colleague who had more to do with the switch from the export on the chart of accounts to the back up, and I’m informed that the report hasn’t changed, although it is now grouped by nominal codes (I’m unsure if it was like this previously). Were you looking to export a particular date range of nominals from your account? Perhaps we can help achieve this? 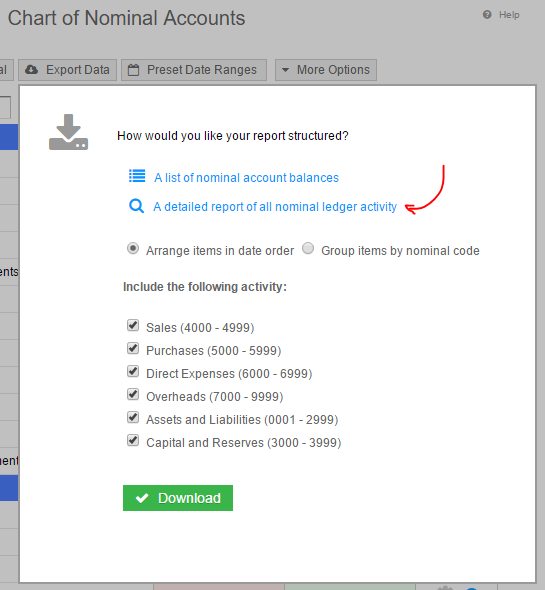 We have brought back the detailed ledger export option on the Chart of Account screen. This will allow you to extract all detailed ledger items for a specific period with the ability to only include selected categories from the Chart of Accounts. The report will contain a summary and a list of detailed transactions arranged in date order or grouped by nominal code. At the moment this report is capped to 15,000 entries. If your reporting period exceeds these number of entries you would need to either narrow the date range or run a backup which will include all ledger entries. Big Thank you for this! Was about to ask for something similar.